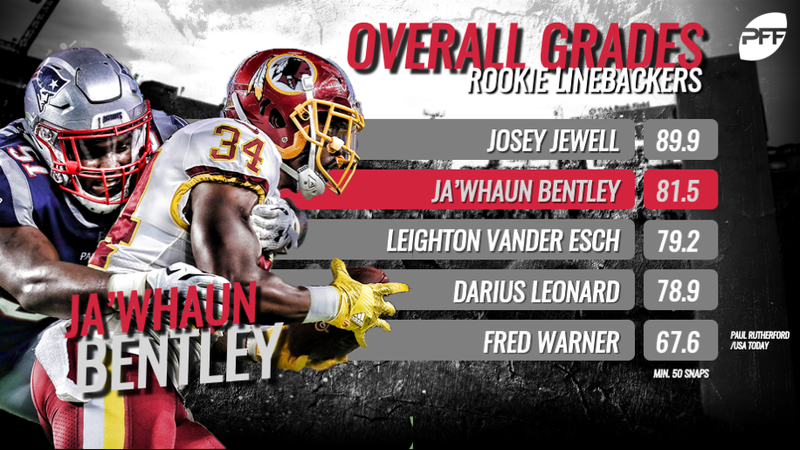 With our third update on 2018’s Race for PFF’s Rookie of the Year award, we have two defensive backs sitting at the top, with four of our top five rookies coming from the defensive side of the football. As always, the top-10, along with the honorable mentions can be found below! James made his debut on this list last week at the No. 2 spot, and his solid performance against the Los Angeles Rams in Week 3 (81.7 overall grade) vaults him up to number one in this week’s update. James has earned an overall grade of at least 70.0 in all three games so far this season, and his versatility has been on full display. On the field for 192 defensive snaps in his first three professional games, James has spent 97 of them at free safety, 52 as a box safety, 20 as a slot corner, three as a boundary corner and he’s even spent 20 snaps on the defensive line. In coverage he’s already gotten his hands on the ball three times, tallying an interception to go with two pass breakups, and he’s also added recorded four defensive stops and six pressures as a pass rusher, two more than any other safety in the league. It’s been a bit of a roller coaster start to the season for Ward, who found himself knocked down into the honorable mentions last week after starting the season at the top of this list. Ward had a great professional debut against the Pittsburgh Steelers in Week 1 (85.6 overall grade), but he followed that up with a stinker in Week 2 against the New Orleans Saints (48.1). He had an elite performance on Thursday Night Football this past week though against the New York Jets (90.9), and on the heels of that he finds himself back towards the top of this list. Against the Jets, the fourth overall pick surrendered just nine total receiving yards on the two catches that he allowed into his coverage, and also produced a stop and a forced fumble. Through three weeks, he ranks sixth among all corners in terms of overall grade and his 86.3 coverage grade ranks third. 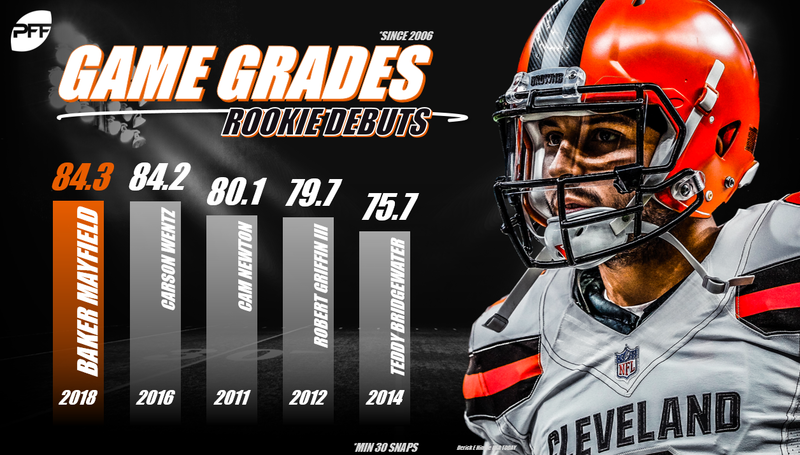 Hernandez ranks seventh among all guards in terms of overall grade and he’s one of just seven guards to have grades of at least 70.0 in both pass protection and as a run blocker. The Giants second-round pick had his first clean sheet in Week 3, after not allowing a single pressure on 35 pass-blocking snaps. Bentley currently ranks ninth among all linebackers in terms of overall grade and he’s one of just seven linebackers who own both run defense and coverage grades north of 70.0. The former Boilermaker has been targeted five times in coverage this season, surrendering three catches for a total of just 19 yards and he came down with his first interception this past weekend in Detroit. 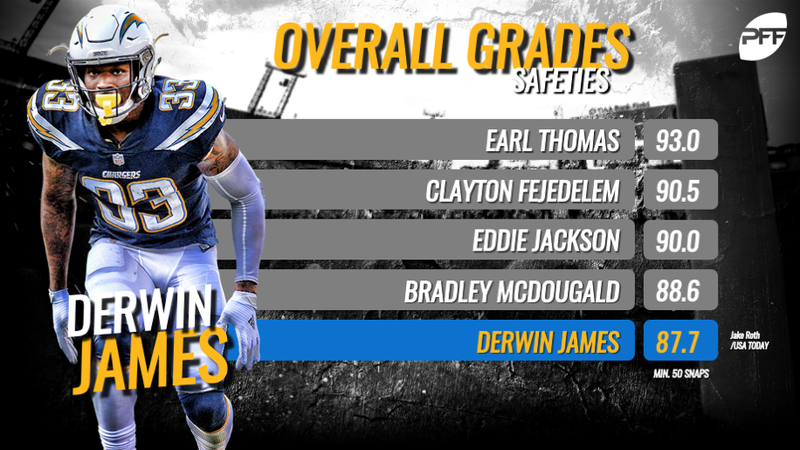 The only player to spend all three weeks within the top-5 of this list, Avery ranks 13th among all edge defenders in terms of overall grade. Avery’s 16.7 run stop percentage ranks fifth among all edge defenders who’ve seen at least 20 snaps in run defense, he forced a fumble in Week 1 that set up a game-winning field goal opportunity for the Browns and in Week 3 he recorded his first NFL pass breakup. Barkley currently ranks 12th among all running backs in terms of overall grade, and he led all running backs in Week 3 with a grade of 84.3. Barkley currently ranks third among all running backs with a 107.3 Elusive Rating (ER measures the success and impact of a runner with the ball independently of the blocking in front of him) and among the 15 running backs who’ve seen at least 40 carries he ranks first with an average of 3.78 yards after contact per attempt. The secret may be out with Bates who currently leads all rookies with 232 snaps played (not including special teams), and he’s been a steady presence at the back end of the Bengals defense through the first three games of his career, having spent 200 of those snaps at free safety. 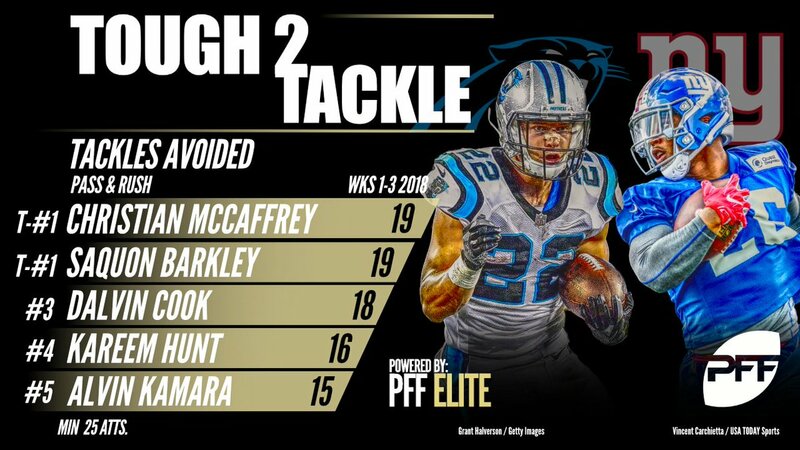 The second-round pick currently ranks eighth among all safeties in terms of overall grade and he’s been one of the best tacklers in the league so far: Bates is one of just 20 NFL defenders – not safeties, all defensive players – to have recorded at least 15 tackles so far this season without missing more than one tackle. Ridley currently ranks 16th among receivers with a 78.6 receiving grade and is fresh off an elite performance in Week 3 where he earned a 91.7 receiving grade in a game that saw him make three trips to the end zone. Ridley ranks 11th among all receivers with an average of 2.41 yards per route run – the next highest rookie in YPRR is Christian Kirk, who ranks 52nd with an average of 1.36 – and Matt Ryan has a near-perfect 154.9 passer rating when targeting the Falcons’ first-round pick. Leonard ranks 15th among linebackers in terms of overall grade after the first three weeks of the season. Leonard has stuffed the stat sheet in his first three games as a pro: He leads all defenders with 33 tackles, ranks second with 16 stops, he’s forced a fumble, recorded three sacks and also broken up two passes. All it took was one half of Baker Mayfield leading the charge for the Cleveland Browns to score their first victory in close to two years, and what a half he had. Mayfield posted a 90.9 adjusted completion percentage against the New York Jets in Week 3, hitting his target on 20 of 22 aimed passes. He was also poised under pressure, earning an 83.3 adjusted completion percentage on his seven pass attempts against defensive pressure. He wasn’t just dinking-and-dunking the ball in his first ever regular season action either; he ranked second among all quarterbacks in Week 3 with 73.6 percent of his passing yards coming through the air.